When the news first starting buzzing across the wires that lost scenes from Metropolis has been discovered, many old hands in the film world suspected a hoax. There have been so many such bogus announcements, perpetrated by the naive, the over-optimistic, and – increasingly – the fraudulent. It is so easy to create a narrative, a plausible history bolstered up with links, pictures and air of expert knowledge, and then to have such rumours speed around the world, finding out the credulous. The amazing thing about Metropolis, and the discovery last year of Bardelys the Magnificent, is that the rumours were true – the lost films had indeed been found. But the lost silent film that is most subject to fantasies of discovery, and which indeed probably comes at the top of many silent film buffs’ wish list of films that they would love to see discover, is London After Midnight. And today the rumours have gone flying around following a rambling but insistent account on a horror film forum that the 1927 Lon Chaney horror film had been found (the argument is that MGM had been hiding it under its alternative release title, The Hypnotist). Of course it hadn’t, as should be obvious to anyone with grain of sense who reads it – it’s riddled with naiveties and fantasies. 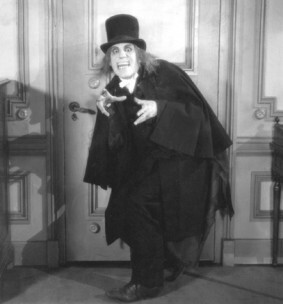 The last known print of London After Midnight is believed to have been destroyed in a vault fire at MGM in 1967. Ever since then the rumours have circulated that a print had survived somehow: that a 16mm copy was in secret circulation, that one or other of the renowned collectors was sitting on a print (not daring to announce its existence for fear of losing it to rights-holders MGM), that MGM itself was sitting on material that for assorted mysterious reasons it had chosen to suppress. Or, in the case of this most recent claim, that MGM was somehow unaware of what was lying on its own shelves. This basic history you can get from Michael Gebert’s London After Midnight Myths pages (though beware that the first few pages do their best to tease the unsuspecting with ‘evidence’ that might indicate the film does exist). It is true that you can find London After Midnight on the TCM schedules every now and then, and on DVD accompanying Chaney’s The Unknown, but this is a 45-minute compilation by Rick Schmidlin of extant stills, recreating therefore what the film looked like. Until a print turns up one day to expose all the so-called experts to ridicule – who knows, as Metropolis has shown, it might be in South America – the Schmidlin recreation is the nearest to this most celebrated of all lost silent films that we have. For more on lost films, see Moving Image Collections’ Lost Films list, the Deutsche Kinematek’s Lost Films wiki and Silent Era’s Presumed Lost section. And continue to dream.